Please note: The information about the Smith Ancestors has been retrieved from an Ancestral File on FamilySearch.org, which I have not personally verified. The earliest known Smith ancestor is Henry Smyth. He was born circa 1607 in Membury, Devon. 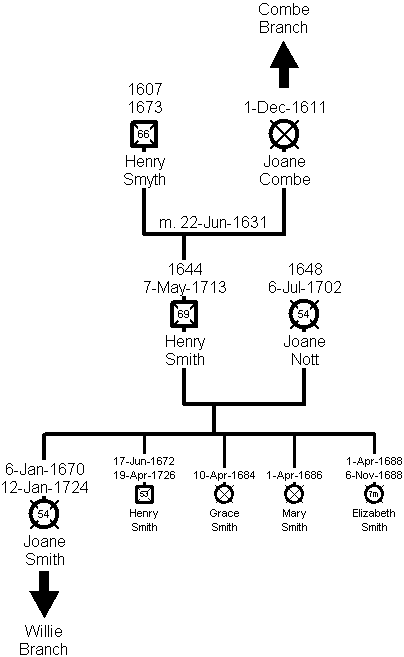 On 22 June 1631, he married Joanne Combe in Otterford, Somerset. They had one child, Henry Smith, born circa 1644. Henry Smyth died circa 1673. Henry Smith was born circa 1644 in Stockland, Dorset. He married Joanne Nott and they had five children. The oldest was Joanne Smith, born circa 1670. Henry died in 1713 and was buried on 7 May 1713 in Otterford, Somerset. Joanne Smith was baptised on 6 January 1670 in Otterford, Somerset. She Married John Willy and they had thirteen children – nine boys and four girls. All thirteen children were baptised in Otterford. Joane died and was buried in Otterford on 12 January 1724.